I wish you a very merry Christmas this year and wanted to remind you of the reason for the season. Jesus is the reason for the season. He’s the reason the holiday is celebrated throughout the world, though many who celebrate Christmas do not believe in Jesus. It’s hard to understand but at least they are reminded of him this time of year and perhaps more seeds can be planted for God to cause to sprout. What’s the reason for the season from your point of view? Is it to give or get Christmas gifts? That’s not a bad thing, we all love presents and man’s greatest joy is experienced in selfless giving. But that’s not the reason for the season. Some say it’s a time for families to get together and visit. Being with family can be a great thing, and catching up can always be fun, but being with your family is not the reason for the season. Arguably you can do that any time you want, though more people have time off at holidays to get together. Still, that’s not the reason for the season. It’s not a good thing, but the original reason for the ‘Christmas’ season was born in idolatry. Originally, Christmas was the celebration of the winter solstice, when the shortest day of the year has come. The celebration included gift giving, singing and many of the traditions now practiced, even by Christians, during the Christmas season. By the time of the Romans, the winter solstice was called the Saturnalia. Again it involved pagan worship and, again, gift giving and merriment. Christmas or Christmas Day (Old English: Crīstesmæsse, meaning “Christ‘s Mass“) is an annual festival commemorating the birth of Jesus Christ, observed generally on December 25 as a religious and cultural celebration among billions of people around the world. A feast central to the Christian liturgical year, it closes the Advent season and initiates the twelve days of Christmastide, which ends after the twelfth night. Christmas is a public holiday in many of the world’s nations, is celebrated culturally by a large number of non-Christian people, and is an integral part of the Christmas and holiday season. While the birth year of Jesus is estimated among modern historians to have been between 7 and 2 BC, the exact month and day of his birth are unknown,and are not the focus of the Church’s Christmas celebration. His birth is mentioned in two of the four canonical gospels. By the early-to-mid 4th century, the Western Christian Church had placed Christmas on December 25, a date later adopted in the East, although some churches celebrate on the December 25 of the older Julian calendar, which, in the Gregorian calendar, currently corresponds to January 7, the day after the Western Christian Church celebrates the Epiphany. In the Council of Tours of 567, the Church “declared the twelve days between Christmas and Epiphany to be one unified festal cycle“, thus giving significance to both December 25 and January 6. The date of Christmas may have initially been chosen to correspond with the day exactly nine months after early Christians believed Jesus to have been conceived, or with one or more ancient polytheistic festivals that occurred near southern solstice (i.e., the Roman winter solstice); a further solar connection has been suggested because of a biblical verse[a] identifying Jesus as the “Sun of righteousness”. The celebratory customs associated in various countries with Christmas have a mix of pre-Christian, Christian, and secular themes and origins. Popular modern customs of the holiday include gift giving, completing an Advent calendar or Advent wreath, Christmas music and caroling, an exchange of Christmas cards, church services, a special meal, and the display of various Christmas decorations, including Christmas trees, Christmas lights, nativity scenes, garlands, wreaths,mistletoe, and holly. In addition, several closely related and often interchangeable figures, known as Santa Claus, Father Christmas, Saint Nicholas, and Christkind, are associated with bringing gifts to children during the Christmas season and have their own body of traditions and lore. Because gift-giving and many other aspects of the Christmas festival involve heightened economic activity, the holiday has become a significant event and a key sales period for retailers and businesses. The economic impact of Christmas is a factor that has grown steadily over the past few centuries in many regions of the world. To be completely honest with you, Christmas is technically a Christianized version of a pagan holiday celebrated from the time of Babylon or shortly after. Originally it was to celebrate the winter solstice and the birth of Tamuz by Sameramis. Tamus was said to be a reincarnation of Nimrod (remember the Tower of Babel?) To bring Greeks into Christianity, the early Catholic Church adopted the celebration and tried to Christianize it, but they left in all the pagan elements and just introduced the birth of Jesus into it. Jesus was probably born in September, not December. In my heart-of-hearts, I know God is not honored by the celebration of Christmas any more than he is honored by the mixture of pagan practices mixed into Christianity. He absolutely abhorred that exact thing in the Old Testament. So what is a committed Christian who wants to please God to do? For years I denounced Christmas for what it is and I even made it my own tradition to hang a small ‘Christmas’ tree upside down from my kitchen chandelier. It always raised eyebrows and I was able to communicate why it wasn’t pleasing to God. I don’t think what I did was wrong, but I’ve shifted from protest to making the best of a bad situation. For the past decade, I’ve taken down the upside down Christmas tree and replaced it with compassion and the opportunity to speak about the birth of Jesus Christ as the true reason for the season. Who knows, I may put up the upside down Christmas tree again, but for now I just would like to give some sound advice. There is much paganism in Christmas, but many don’t even realize it’s there. The Christmas tree is said to come from pagan origins, having meaning of perpetual life in the deadness of winter. Lighting candles, transposed to the modern day Christmas lights and lighting of candles in church, is also pagan in origin. Even the gift giving is of pagan origin. So what’s left if we remove all of those pagan things? Merry Christmas to you and your loved ones. 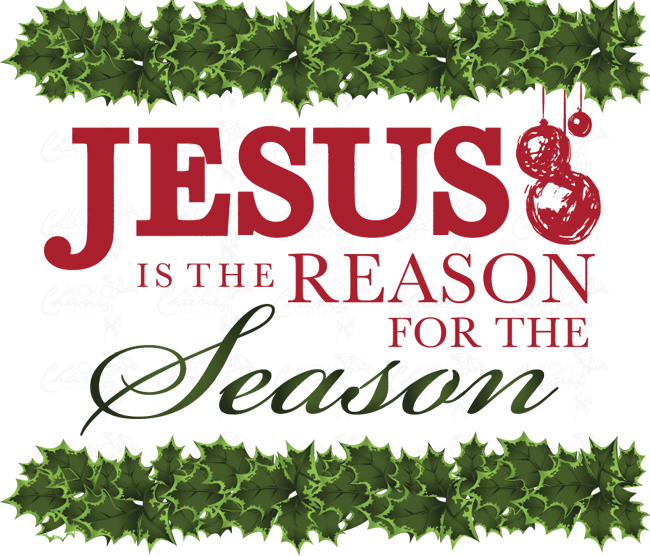 Jesus is the true reason for the season; you don’t need anything else. What Christians need is unity, not division, not pride-filled fragmentation. .
Accommodation of local culture, as seen in the various feasts currently surrounding Christ’s birth, can be condemned until the cows come home. But it won’t help all those followers of Jesus Christ spread his message of love and hope, to a world desperately in need of it. Why not spend time on something more productive, more positive, more pleasing to God?